Samantha Elliott, President of Preferred Corporate Housing, was honored with the Tower of Excellence award for 'Large Provider, Individual Member of the Year.' This award is given to an outstanding employee, executive or owner who maintains more than 300 corporate apartments, and who has demonstrated commitment and excellence within their company and the corporate housing industry as a whole. Samantha's dedication to the day-to-day success of her company along with the time and leadership she gives as a current Board Member of the Corporate Housing Provider's Association make her a well-deserving recipient of this year's award. "Preferred Corporate Housing and Samantha Elliott's support of CHPA has been instrumental in growing the Association," says CHPA's Mary Ann Passi, CEO. 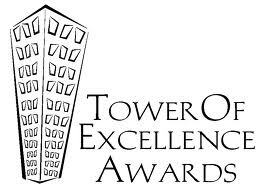 "CHPA's Tower of Excellence Awards recognize companies and individuals for their exemplary contributions to the corporate housing industry and communities in which they operate. Samantha is a great example of an individual always striving for the next level of excellence for the industry and her company." After the award was announced, Samantha had this to say in response, "I am extremely honored to receive this award. There is so much talent, dedication, and leadership in this room, and it feels amazing to be recognized among my peers.